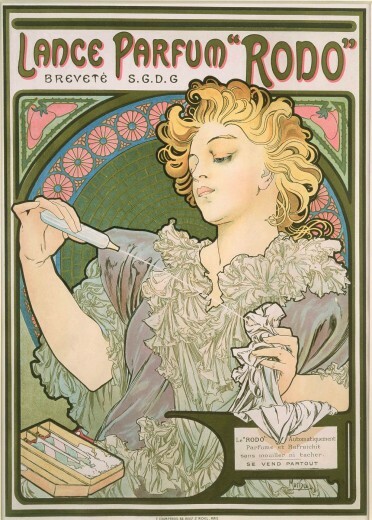 This poster advertises a perfume produced by the Société des Usines Chimiques du Rhône in Lyon. Mucha's elegant and graceful turn-of-the-century women were particularly successful in appealing to female audiences. As a result, his commercial work was in great demand from cosmetic companies. Clients included Sylvanis Esssence, Parfumerie Bleuze-Hadancourt, Savonneries de Bagnolet and Carmichael's Bath Tablets in England.